Center plate. High gloss finish. Thermoplastic construction for durability and flexibility. Easy to snap together and lock. Mid-size design to fit over most existing wall openings. Screw-Catch feature holds already attached mounting screws captive for easy installation. Screws are slotted steel, baked enamel and painted. Meets current Federal specifications as tested to UL 514 (file no. E33216). Meets CSA standard C22.2, No. 42.1, (file no.9294). NEMA WD-1, WD-6. Meets flammability requirements per UL 94, V2 rated. Temperature rating -40 degrees C to 70 degrees C. End plate. High gloss finish. Thermoplastic construction for durability and flexibility. Easy to snap together and lock. Mid-size design to fit over most existing wall openings. Screw-Catch feature holds already attached mounting screws captive for easy installation. Screws are slotted steel, baked enamel and painted. Meets current Federal specifications as tested to UL 514 (file no. E33216). Meets CSA standard C22.2, No. 42.1, (file no.9294). NEMA WD-1, WD-6. Meets flammability requirements per UL 94, V2 rated. Temperature rating -40 degrees C to 70 degrees C. End plate. High gloss finish. Thermoplastic construction for durability and flexibility. Easy to snap together and lock. Mid-size design to fit over most existing wall openings. Screw-Catch feature holds already attached mounting screws captive for easy installation. Screws are slotted steel, baked enamel and painted. Meets current Federal specifications as tested to UL 514 (file no. E33216). Meets CSA standard C22.2, No. 42.1, (file no.9294). NEMA WD-1, WD-6. Meets flammability requirements per UL 94, V2 rated. Temperature rating -40 degrees C to 70 degrees C.
Center plate. High gloss finish. Thermoplastic construction for durability and flexibility. Easy to snap together and lock. Mid-size design to fit over most existing wall openings. Screw-Catch feature holds already attached mounting screws captive for easy installation. Screws are slotted steel, baked enamel and painted. Meets current Federal specifications as tested to UL 514 (file no. E33216). Meets CSA standard C22.2, No. 42.1, (file no.9294). NEMA WD-1, WD-6. Meets flammability requirements per UL 94, V2 rated. 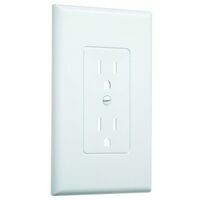 Temperature rating -40 degrees C to 70 degrees C. Hubbell Wall Plate, 1-Rocker, 4.75 in Length, 2.93 in Width, 0.32 in Depth, 1 Gangs, Plastic, White, Screw Mounting, Includes: Matching Screws Screwless mid-size wall plates are virtually unbreakable and present a clean, minimalist look that can be changed in seconds. Easy installation, simply screw the mounting plate onto the wiring device and press into place. Mid-size. Screwless mid-size wall plates are virtually unbreakable and present a clean, minimalist look that can be changed in seconds. Easy installation, simply screw the mounting plate onto the wiring device and press into place. Mid-size. Screwless mid-size wall plates are virtually unbreakable and present a clean, minimalist look that can be changed in seconds. Easy installation, simply screw the mounting plate onto the wiring device and press into place. Mid-size. Screwless mid-size wall plate, virtually unbreakable and present a clean, minimalist look that can be changed in seconds. Easy installation, simply screw the mounting plate onto the wiring device and press into place. 4.875" x 3.125". Screwless mid-size wall plate, virtually unbreakable and present a clean, minimalist look that can be changed in seconds. Easy installation, simply screw the mounting plate onto the wiring device and press into place. 4.875" x 3.125". Screwless mid-size wall plate, virtually unbreakable and present a clean, minimalist look that can be changed in seconds. Easy installation, simply screw the mounting plate onto the wiring device and press into place. 4.875" x 3.125". Screwless mid-size wall plate, virtually unbreakable and present a clean, minimalist look that can be changed in seconds. Easy installation, simply screw the mounting plate onto the wiring device and press into place. 4.875" x 3.125". Designed to match designer opening dimmers, sensors, fan controls, switches and accessories. Clean appearance with no visible screws. Mounts flush to the wall. Oversized to hide gaps around wallboxes. Snap-on design attaches securely and snugly in place regardless of wall condition. Virtually unbreakable and present a clean, minimalist look that can be changed in seconds. Easy installation, simply screw the mounting plate onto the wiring device and press into place. Mid-size - 4.87" x 4.94" Virtually unbreakable and present a clean, minimalist look that can be changed in seconds. Easy installation, simply screw the mounting plate onto the wiring device and press into place. Mid-size - 4.87" x 4.94"
Screwless mid-size wall plates are virtually unbreakable and present a clean, minimalist look that can be changed in seconds. Easy installation, simply screw the mounting plate onto the wiring device and press into place. Screwless mid-size wall plates are virtually unbreakable and present a clean, minimalist look that can be changed in seconds. Easy installation, simply screw the mounting plate onto the wiring device and press into place. Screwless mid-size wall plates are virtually unbreakable and present a clean, minimalist look that can be changed in seconds. Easy installation, simply screw the mounting plate onto the wiring device and press into place. Designed to match designer opening dimmers, sensors, fan controls, switches and accessories. Clean appearance with no visible screws. Mounts flush to the wall. Oversized to hide gaps around wallboxes. Snap-on design attaches securely and snugly in place regardless of wall condition. Screwless mid-size wall plates are virtually unbreakable and present a clean, minimalist look that can be changed in seconds. Easy installation, simply screw the mounting plate onto the wiring device and press into place. Screwless mid-size wall plates are virtually unbreakable and present a clean, minimalist look that can be changed in seconds. Easy installation, simply screw the mounting plate onto the wiring device and press into place. Mid-size.